"Stop the BS! : I Just Want the Truth About Dieting, Supplements, Weight Loss, and Exercise” is a must-read book that explores the realities of the diet and food supplement industries. 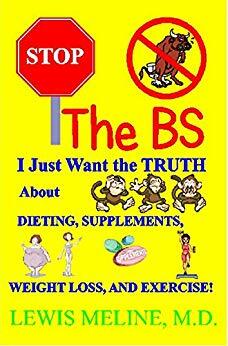 “Stop the BS!” reaches out to readers who are ready to commit to changing their lifestyles for a better and healthier version of themselves. Dr. Meline highlights the lies promoted by many supplements, weight-loss schemes, exercise programs and imparts the right information that people need to achieve their goals. His expertise explains that despite these diet programs and supplements, obesity continues to worsen throughout the United States and in fact the world. He shares decades-worth of research helping readers become healthier naturally instead of spending a lot of money on special diet and supplemental programs that don’t achieve the promised results. Indeed, Dr, Meline’s expertise shared in “Stop the BS!” is a great resource that helps readers start their journey towards a healthier life. Catch this book on display along with other great titles from different genres during the upcoming 2019 Los Angeles Times Festival of Books on April 13-14, 2019. Don’t miss it! Written by: Lewis Meline, M.D. Dr. Meline is an avid weightlifter and outdoor enthusiast who enjoys waterskiing and dirt biking. He is a medical doctor who is a nutrition and exercise expert. For more than forty years, he has researched nutrition, obesity, and exercise, and has published several articles and abstracts in medical journals. As he applied nutrition and exercise information, many discrepancies in the advertised results and the actual results were noted. This led him to research the reasons for these discrepancies. What he discovered will upset the entire diet, supplement, and weight-loss industry.